Los Angeles-based painter premieres new printmaking techniques at Luther W. Brady Art Gallery’s “Reinvigorating Prints” exhibit. 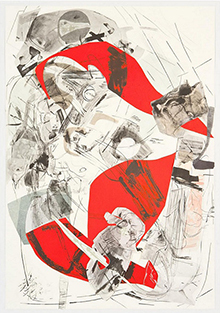 “Red Squall: Wave” is the first piece visitors encounter upon entering Iva Gueorguieva’s show “Reinvigorating Prints” at the George Washington University’s Luther W. Brady Art Gallery. A massive print abstraction bursting with color, its scale and complexity create the effect of swallowing in audiences. Aggressive black lines and sea-foam green patches lure the eye, and the use of multiple processes—monoprinting, lithography and hand painting—challenge the viewer to untangle how each layer was made. 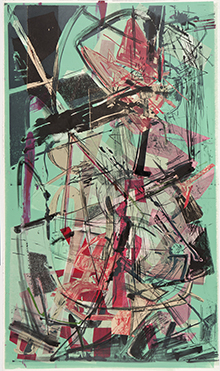 This piece sets the tone for the rest of the exhibition, a dizzying journey into color and diverse printmaking techniques. Ms. Gueorguieva, a Bulgarian-born artist, is primarily known for her complicated paintings. Her foray into printmaking was as an artist-in-residence at the University of South Florida’s Graphicstudio in 2011. The results of her time there include the prints and collages featured in “Reinvigorating Prints,” which opened at the Brady Art Gallery on March 27. George Washington Today spoke to Ms. Gueorguieva about the new pieces, what she’s learned from her newfound love of printmaking and the art of experimentation. Q: How were you introduced to the printmaking process? A: When I first toured Graphicstudio, the printmakers were amazing and they kept explaining how everything was made. It all seemed very complicated and remote and strange. It reminded me of a chemical lab in the movies—I kept trying to follow, but I wasn’t able to keep up with the jargon. I was also in complete awe of the way they handled paper and moved through this space filled with machinery. I was really scared because I didn’t know what to expect. Yet once I got there, it all revealed itself very organically. They would say, “Here’s a plate and if you make these marks, this is what’s going to happen.” I fully trusted the process. 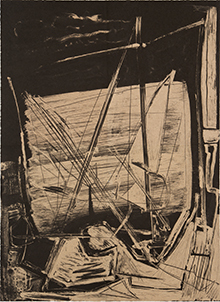 Q: Did a lot of the work start with sketches you’d made in your studio, or did any pieces develop through experimentation with the printmaking techniques? A: Every time, I’ve started from a different place. For “Red Squall: Wave,” they had one huge press from the ’60s. I wanted to use that particular press and the largest piece of paper it could handle. In the midst of this pretty complicated process, I needed something much simpler. So simultaneously, I was also working directly on a “soap ground”—a really amazing technique, basically like painting negative elements with white paint—for “Dusk Mast.” It was very direct, compared with working on “Red Squall: Wave,” which started in pieces. Q: Some of the prints and collages use materials that are hard to manipulate, like fabric, which wrinkles easily. How do you reconcile between what is intentional and the accidents that inevitably happen through these complicated processes? A: In some of the monoprints, for example “Conspiracy Amidst the Wings,” there were many times when I thought my next move might completely destroy weeks of work. I kept working on it for a while and toward the end, I said, “Let’s just lay a thin layer of black over it.” One of the printmakers looked at me like I was completely out of my mind because after all of the work on it, I was going to cover the piece in black. There were many points where I had no idea what would happen. I kept thinking, “This could be too transparent or too opaque or it could just completely destroy all this rich blue color.” So it was kind of a leap of faith—knowing my next move could be the end of the entire piece. But that’s what made the process exciting. Q: You’ve talked about how much you need alone time in your studio to decompress your thoughts. How did collaborating with printmakers compare to working in silos in your studio? A: At Graphicstudio, those collaborative experiences become absolutely central. It’s something that I need to do every six months. It’s such a unique place—it’s utterly about invention and thought. It feels completely free of market pressures or life pressures … It’s strangely similar to working in the studio and at the same time, it’s so different and dynamic and very free. I’ve now experienced that euphoria of working with other people. I’ll never give up working in the studio, but now I’m working with a friend who is a filmmaker in a project involving dancers and with another friend who is helping me create sculptures. The printmaking experience has opened me up. Q: There’s constant movement in your paintings. You often abstract where a piece starts and where it ends. Was this easy to replicate using printmaking techniques? A: With my paintings, I’ve been told the experience for viewers unfolds in multiple ways. You look away for a moment and you come back to that same area and, all of a sudden, you don’t see what you saw before. So that folding and unfolding of time is something that’s very important to how I compute spaces—those multiple entry points and the bending of space using multiple spatial constructions, like overlapping. In the prints, the tension and demands of the process push you toward a more linear interpretation. But I’ve been really trying to complicate that and make it less the case. Especially with more complicated prints, it becomes hard to read what’s on the main surface, what’s hand painted and so on. I think it ends up a similar complication of time—both in how it’s made, but also how the viewer experiences it. Q: Did your relationship to scale change in the process of printmaking? Your works have traditionally been large. A: I’ve always worked in my sketchbook, but there was a period of a few years when I was not in any way interested in making small paintings. But because of the limitations of paper and the presses, printmaking challenged me to confront medium and small scales. I’m now working simultaneously on a painting that’s 10-by-16 inches and one that’s 180-by-180 inches. They’re side by side, and it’s as intense and as rewarding looking at the tiny painting. I’m also doing a lot of work on paper. The printmaking has opened up a whole different experience in my relationship to paper. Something about the limitations of each medium and scale allow certain questions to be more forcefully addressed. I’ve come out of these situations with a better understanding of what I’m doing. Q: Stories from your childhood in Bulgaria have influenced your earlier paintings. Did narratives have a role into your printmaking? A: “Conspiracy Amidst the Wings” had a lot to do with memories of my father. He worked on airplanes, so when I was a kid, I spent a lot of time in Bulgarian airports. The piece is about my connection to airplanes and flying and altitudes. I have a friend who’s a pilot and when he saw that print, he was really struck by a particular blue he’s only seen before at really high altitudes in the sky. I think of each painting as layers of coincidence and memories. Not everything goes; it’s just particular experiences that become central to what I’m doing. There are themes that insert themselves and ones that I constantly return to—the absurdity of certain things; the violence and fear I feel toward economic structures, political structures, day-to-day structures; my relationship to being a parent. The in-the-moment concerns filter into the work, but there are also particular memories, particular dreams, particular encounters that leave a mark … Stories, images, they all get layered into the pieces. Q: In music, when there’s a lot of layering, musicians describe an innate feeling of when they can hear that the layering is complete. Can you relate to that instinct? A: I know that feeling you’re talking about—my husband is a musician and the way he cuts up music is very similar to how I work in the studio, but with sounds. The tendency is sometimes to say, “If I put down another layer, it’ll make it better.” It has to be appropriate to what happened in a previous layer. I play chess, and it’s very much like that: You know this move will necessitate 10 other moves. In chess, you can control your opponent to a certain extent. In art, my opponent is the paper or the technique—there are always some curve balls. But after years of experience I’m capable of letting failures take place and still staying in control. I think for me, it’s become about understanding the process as it unfolds in terms of these moments and moves. It’s less about layering and much more about knowing what moves each piece will take and knowing in advance when a piece is done.